What is the Gas Emitted When Burning Wood? Why Does Burning Wood Pop & Crackle? The popping and crackling sounds of a wood fire are so reassuring and cozy that they have been marketed in DVD form for enjoyment by apartment dwellers and others unable to have a real fire. Few other materials produce these sounds when they burn. Paper, grass and cardboard may burn with a satisfying flame, but they do so more or less silently. Leaves make crackling sounds, though, for the same reason that wood does. Rapidly expanding gases inside the pores of the burning material are responsible. 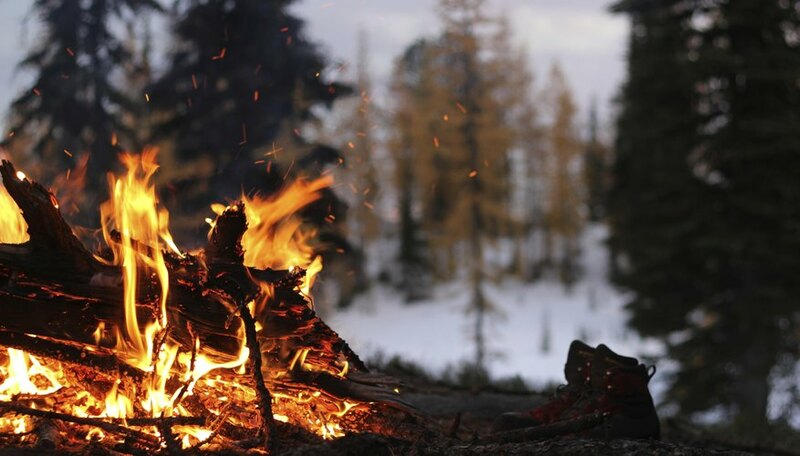 The crackling sound from wood fires comes from the sudden escape of combustion gases from pores in the wood. During this process, the wood isn't burning. The wood is sublimating (changing state from solid to gas), and the gases produce the flames. If the temperature isn't high enough to ignite the gases, they dissipate – together with unburnt wood particles – as smoke. Wood isn't as solid as it looks. It's filled with microscopic cells with walls made of cellulose, which is the substance that sublimates during combustion. As the cellulose changes state and releases gas, the gas is trapped in the pores between cells. As the temperature rises, the gas quickly expands and puts pressure on the cell walls that haven't yet sublimated. The combination of expanding gas and weakening cellulose eventually ruptures the cell walls and allows the gas to escape in a mini explosion, which produces the familiar cracking and popping sounds associated with a wood fire. The structure of a typical log isn't uniform. It may have a knot or a void. When combustion gases collect in one of these spaces, they may build up enough pressure to cause a larger-than-normal explosion that can hurl wood debris a distance away from the fire. For this reason, it's a good idea to protect a fire in your fireplace with a metal mesh screen and to keep a safe distance from bonfires and campfires. PhysLink.com: Why Does Firewood Crackle When It Is Thrown in a Fire? How Do Butane Lighters Work? Deziel, Chris. "Why Does Burning Wood Pop & Crackle?" Sciencing, https://sciencing.com/does-burning-wood-pop-crackle-4910112.html. 05 April 2018.